Product Description: A highly pigmented alkyd finish for ceilings. 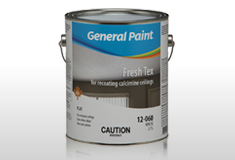 Excellent hiding power and dries to a uniform and gloss-free finish. not dissolve ceiling texture and hide most stains. Application Thinner: Not normally required. All surfaces must be clean, dry and free from dust, dirt, grease, mildew or wax. Repair damaged areas with patching compound. Lightly brush textured ceilings with a broom to remove any loose particles prior to painting.If there is severe staining a stain blocking primer may be required. Application: Brush, Roller, Air Spray or Airless Spray. A Long nap (20mm to 30mm) or a specially designed split foam roller are recommended for heavy texture. Airless Tips: .013" - .017"
Additional Data: Spreading rate figures have been calculated based for the paint applied on an ideal smooth and non-absorbent substrate. The actual spreading rate will be significantly lower (25% to 50% less is typical) depending on the porosity and texture profile of the ceiling.